The position statements at the links below represent some of the best thinking of state and national leaders as they respond to important issues related to music education. When discussions in a school or community approach these issues, educators and community members are encouraged to refer to these position statements so better inform the discussion. It can often be helpful to draw upon information from sources outside of the local area. Music, Choral Music and General Music). Wisconsin Music Educators Association dedicates itself to representing the shared interests and needs of Wisconsin music educators and fostering their growth in a global society. This is our mission and it applies to ALL people, regardless of race, ethnicity, demographic or socioeconomic status. WMEA, in affiliation with NAfME, recognizes that there is continuous room for growth in the areas of inclusion, diversity and equity and it is our ongoing commitment and priority to promote these important aspects in the music profession so that we can grow together while providing the best music education possible for ALL students. In a world where high stakes testing and shrinking resources tend to narrow the focus of teaching and learning to a limited number of core subjects, the strategies employed and skills taught by professional music and arts educators that target the whole child are proven to support crucial brain development and lead to educational outcomes considered essential for college, career and citizenship readiness: increased focus and academic achievement; collaboration and school engagement; and innovation and creative thinking. The synergy that is created when training in the arts combines with scientific thinking, as illustrated by the work of inventors over the centuries, has led business leaders, educators, scientists and government agencies to acknowledge that artistic thinking, along with science, technology, engineering and mathematics, are what truly drive creativity, innovation and economic growth. The ability to express oneself through music, movement, art and performance helps build self efficacy, nurtures and reflects our different culture(s), and helps break down traditional barriers – illustrating what we have in common and reinforcing what makes us uniquely human. No child should be denied access to such lifelong benefits. As such, music and the arts must continue to be supported as core academic areas of study for all Wisconsin children. We, the undersigned representatives of professional education associations, share a deep concern about the nature, role, importance, and future of arts education in the schools where our members teach, administer, supervise, and make and implement education policy. We are unanimous in our agreement that all Americans who share our concern about the quality of education in general, and of arts education in particular (dance, visual arts, music, theatre), should understand the value of arts education for every child, and we encourage those who will work with us to enhance and support arts education in our nation’s schools. To that end, we invite all Americans, both within the professional education community and outside it, to join us in support of the following principles. First, every student in the nation should have an education in the arts. This means that all PreK-12 students must have a comprehensive, balanced, sequential, in-school program of instruction in the arts, taught by qualified teachers, designed to provide students of all ages with skills and knowledge in the arts in accordance with high national, state, and local standards. Second, to ensure a basic education in the arts for all students, the arts should be recognized as serious, core academic subjects. The arts should not be treated as extracurricular activities, but as integral core disciplines. In practice, this means that effective arts education requires sequential curricula, regular time-on-task, qualified teachers, and a fair share of educational resources. Similarly, arts instruction should be carried out with the same academic rigor and high expectations as instruction in other core subjects. Third, as education policy makers make decisions, they should incorporate the multiple lessons of recent research concerning the value and impact of arts education. Fourth, qualified arts teachers and sequential curriculum must be recognized as the basis and core for substantive arts education for all students. Fifth, arts education programs should be grounded in rigorous instruction, provide meaningful assessment of academic progress and performance, and take their place within a structure of direct accountability to school officials, parents, and the community. In-school programs that are fully integrated into state and local curricula afford the best potential for achieving these ends. Sixth, community resources that provide exposure to the arts, enrichment, and entertainment through the arts offer valuable support and enhancement to an in-school arts education. As a matter of policy or practice, however, these kinds of activities cannot substitute for a comprehensive, balanced, sequential arts education taught by qualified teachers, as shaped by clear standards and focused by the content of the arts disciplines. Seventh, and finally, we offer our unified support to those programs, policies, and practitioners that reflect these principles. On behalf of the students we teach, the schools we administer and work in, and the communities we serve, we ask all Americans who care deeply about making the whole spectrum of cultural and cognitive development available to their children to join us in protecting and advancing opportunities for all children to receive an education in the arts. With 15,000 members, the American Association of School Administrators, founded in 1865, is a professional organization for superintendents, central office administrators, and other system-wide leaders. The American Federation of Teachers, which has more than 2,100 locals nationwide and a 1998 membership of 980,000, was founded in 1916 to represent the economic, social, and professional interests of classroom teachers. The Association for Supervision and Curriculum Development is an international, nonprofit, nonpartisan education association committed to the mission of forging covenants in teaching and learning for the success of all learners. ASCD was founded in 1943 and is one of the largest professional education associations in the world, with membership approaching 200,000. Council for Basic Education Editors note: This council was dissolved in 2004 due to lack of funding. The mission of the Council for Basic Education is to strengthen teaching and learning of the basic subjects – English, history, government, geography, mathematics, the sciences, foreign languages, and the arts. CBE, with a readership base of 3,000, advocates high academic standards and the promotion of a strong liberal arts education for all children in the nation’s elementary and secondary schools. The Council of Chief State School Officers represents public officials who lead the departments responsible for elementary and secondary education in the states. CCSSO advocates legislative positions of the members and assists state agencies with their leadership capacity. Dedicated to educational excellence and high professional standards among K-8 educators, the National Association of Elementary School Principals serves 28,000 elementary and middle school principals in the United States and abroad. The National Association of Secondary School Principals is the nation’s largest organization of school administrators, representing 43,000 middle, junior, and senior high school principals and assistant principals. NASSP also administers the National Association of Student Activity Advisors, which represents 57,000 members, as well as the 22,000 chapters of the National Honor Society. The National Education Association is the nation’s largest professional employee organization, representing more than 2.4 million elementary and secondary teachers, higher education faculty, education support personnel, school administrators, retired educators, and students preparing to become teachers. The National PTA, representing 6.5 million members, is the largest volunteer child advocacy organization in the United States. An organization of parents, educators, students, and other citizens active in their schools and communities, the PTA is a leader in reminding our nation of its obligations to children. Membership in the National PTA is open to anyone who is concerned with the health, education, and welfare of children and youth. The National School Board Association represents the nation’s 95,000 school board members through a federation of state associations and the school boards of the District of Columbia, Guam, Hawaii, and the U.S. Virgin Islands. NSBA’s mission is to foster excellence and equity in public education through school board leadership. There is a demonstrated, direct correlation between improved SAT scores and time spent studying the arts. In 1997, The College Board reported that students with four years of study in the arts outscored students with no arts instruction by a combined total of 101 points on the verbal and mathematics portions of the SAT. Statistically significant links are now being reported between music instruction and tested intelligence in preschool children. In one widely cited study (Neurological Research, Feb. 1997), after six months, students who had received keyboard instruction performed 34% higher on tests measuring temporal-spatial ability than did students without instruction. The findings indicated that music instruction enhances the same higher brain functions required for mathematics, chess, science and engineering. As numerous school-based programs have repeatedly reported around the country, study of the arts helps students think and integrate learning across traditional disciplinary lines. In the arts, they learn how to work cooperatively, pose and solve problems, and forge the vital link between individual (or group) effort and quality of result. These skills and attitudes, not incidentally, are vital for success in the 21st century workplace. Sequential arts education also contributes to building technological competencies. It imparts academic discipline and teaches such higher level thinking skills as analyzing, synthesizing, and evaluating both personal experience and objective data. Finally, research findings indicate that arts education enhances students’ respect for the cultures, belief systems, and values of their fellow learners. It is the position of the Wisconsin Music Educators Association that the study of religious music is a vital and appropriate part of the total music experience in both performing and listening. The omission of sacred music from the repertoire or study of music would present an incorrect and incomplete concept of the comprehensive nature of the art form. The First Amendment does not forbid all mention of religion in the public schools; it prohibits the advancement or inhibition of religion by the state. A second clause in the First Amendment prohibits infringement of religious beliefs. Nor are the public schools required to delete from the curriculum all materials that may offend any religious sensitivity. The following questions are relevant to the constitutional standards of religious neutrality necessary in the public schools. Is the purpose secular in nature; for instance, studying music of a particular composer’s style or historical period? What is the primary effect of the activity? Is it the celebration of religion? Does the activity either enhance or inhibit religion? Does it invite confusion of thought or family objections? Does the activity involve an excessive entanglement with a religion or religious group, or between the schools and a religious organization? Music educators should exercise good judgment in selecting sacred music for study and programming for public performances. During the planning phase of instruction or programming, the following questions should be considered by each teacher in determining if a program is acceptable. Is the music selected on the basis of its musical and educational value rather than its religious context? Are the traditions of different people shared and respected? Is the excessive use of sacred music, religious symbols or scenery, and performance in devotional settings avoided? Is the role of sacred music a neutral one, neither promoting nor inhibiting religious views? Are all local and school policies regarding religious holidays observed? Is there understanding of the various religious beliefs and sensitivities represented by the school-children and parents? Middle grade educational practices have been in the throes of tumultuous change in the 1980’s. Movement away from the high school model and toward a student centered, exploratory curriculum has created what many have termed the Middle School Philosophy.” The resulting shift of educational priorities within this model has affected music education dramatically in many of our schools. Recognizing this fact, the WISCONSIN SCHOOL MUSIC ASSOCIATION, after an extensive study of current state wide practices, acknowledges the following as their belief regarding what should be the status of music offerings in our Wisconsin middle schools and junior high schools. That general music experiences should be an integral part of every child’s middle grade experience on ALL grade levels. Schools which are not offering this option should closely examine schedules of schools that do. That performance opportunities in band, orchestra and chorus should be available as elective options to all middle grade students and that small group or individual lessons should be an integral part of each performance curriculum. That students enrolled in instrumental or choral music should have opportunity for both large group and small group instruction during the school day. That music curricula should be concept based and sequential and should include opportunities for creating and describing music, as well as performing music. That middle grade students should be allowed to experience performance in both vocal and instrumental groups. That performance music classes should meet regularly throughout the school year and not be subject to interruption from alternate exploratory options. If education in the 21st century is to be the key ingredient in our survival as a free nation of creative thinkers and doers, it must indeed mean more than reading, writing and mathematics. Quality education means total education – which includes thinking, feeling, moving, singing, playing, dancing and creating. These also are basics. Music is a fundamental mode of learning and expression. Students who are to possess the understanding and meanings which make music possible must be supplied with programs of instruction that allow this to develop. A complete music program in the middle, junior or senior high school, intended to offer all students opportunity for music study, must include three basic types of music offerings: Choral Music, Instrumental Music, and General Music. As a category, general music can be unique in its primary purposes of refining the aural perception and musical curiosity of all students. As a part of a complete music program, general music offerings should be available without prerequisites for participation at all grade levels. 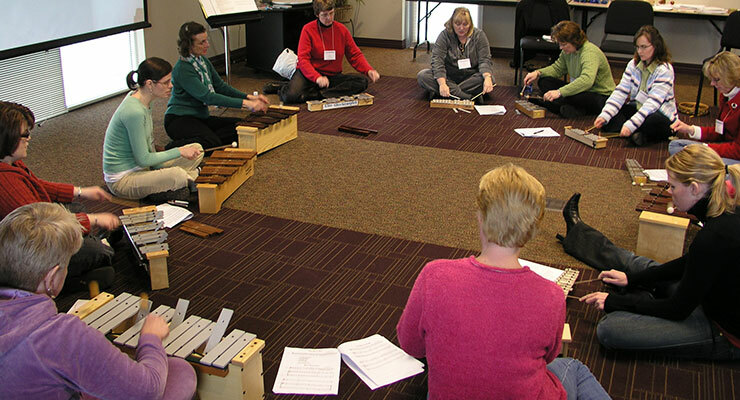 Secondary level general music offerings should be designed to apply, extend and enrich the foundation of musical understandings, skills and attitudes provided by elementary general music experiences. General music may be viewed as courses where the principal means of experiencing music are through a) listening, b) hands-on performing and creating, and c) relating to other art forms and history. Examples of offerings which may fit into the general music category include related arts, music appreciation, survey courses, electronic music, computer assisted instruction, the study of folk instruments, music in society, music technology, keyboard or guitar instruction, and ancient instruments. Making music alone and with others. Using the vocabulary and notation of music. Responding to music aesthetically, intellectually, and emotionally. Becoming acquainted with a variety of music styles. Understanding the role music has and does play in our lives. Making aesthetic judgements based on critical listening and analysis rather than on stereotypes and/or prejudices. Developing a commitment to music learning. Supporting music in the community and encouraging others to do so. Integrating music with other subject areas. The expansion of general music offerings in the secondary school should be carried out without diminishing existing music offerings which focus upon music performance. The three types of music offerings (choral music, instrumental music, and general music) can be complementary if the inauguration of non-performance courses is approached carefully and imaginatively. A new general music offering may require adjustments in staffing in order to provide instruction. Administrators and teachers need to be aware that there is a secondary general music certification which applies to teachers certified after 1982 in Wisconsin. Some teachers may need to upgrade their existing certification or request provisional certification in order to comply with state requirements. All music teachers have skills and knowledge which can be applied to the implementation of a middle or high school general music offering of some kind. It is recommended that the person responsible for teaching a new general music offering be identified soon enough to allow for involvement in the planning of the course design and content. The offering of quality music courses is of little value if students cannot schedule them. Instructional time and scheduling for general music courses should be appropriate to the type of experience being offered and consistent with existing policies of the school. Depending on these factors, a general music offering may be daily, every other day, quarterly, semester long, or year long. In addition, some courses are more appropriately taught by more than one staff member. In order to meet state requirements, more than one high school general music offering will need to be designed. For instance, four different courses could be designed and one of them offered each year. This would allow students to elect a different offering each year. Or, another option would be to offer different levels of the same course so that students may progress through each level if they wish to do so. Independent study for small numbers of students is also possible. One way or another, interested students can be accommodated. General music courses should be designed to meet the course credit criteria which are applied to other academic courses in the school. For those courses which meet these criteria, grade point and graduation credit comparable with other academic subjects should be given. Listening based or related arts general music courses need to be provided with a high quality stereo system (record, tape or CD) as well as a budget for recorded music and other related materials. For hands-on performance or creative experiences, the school may need to purchase or lease instruments such as electronic keyboards, guitars, rhythm instruments, recorders, computer software, etc. Needed equipment can include a combination of school owned and privately owned(or leased) equipment. For thousands of Wisconsin citizens, junior or senior high school may be their last opportunity for the study of music with a qualified music teacher. This makes it essential that all three types of basic music offerings: choral music, instrumental music, and general music be available to all students. Wisconsin school administrators and music teachers can work together to provide meaningful music learning opportunities for all students. The Wisconsin School Music Association will work to be a part of the effort to see that the third component of the basic music program, general music, becomes a part of the secondary school curriculum.